Description:She is the largest of North Dakota’s large animals: bigger than the bull in Pettibone, the buffalo in Jamestown, the turtle in Bottineau, the other turtle in Dunseith, the walleye in Garrison. 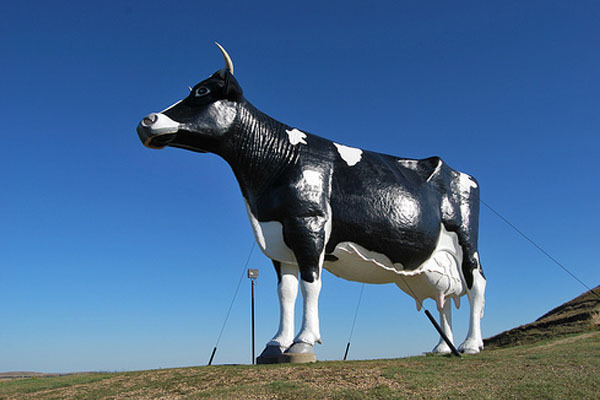 You can see her mighty silhouette from neighboring counties on a clear day: a goddess of dairy, ready to be worshipped. A steady stream of interstate pilgrims pull off of the highway and make the slow drive up the steep, narrow, twisting gravel road to the summit. A sign encourages everyone to drop a dollar into a milk can, thoughtfully provided, to help pay for Sue’s maintenance.